With my recent glut of beetroot I wanted to ensure that they didn’t go to waste. I love the flavor of beetroot and particularly how it sweetens when cooked. 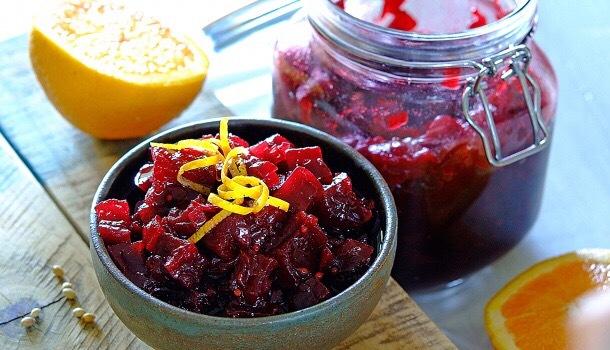 So here is a recipe for a spicy beetroot chutney that complements just about anything. It’s dead simple and when put into preserving jars it can make a great little gift to add to a hamper. Mix all of the ingredients together in a large saucepan. Bring to a gentle simmer, then cook for one hour or even longer, stirring occasionally, until the chutney is thick and the beetroot is tender. While the chutney is cooking, prepare the preserving jars by washing thoroughly and then put in a hot oven to sterilise for 10-15 minutes. Once the chutney is ready, let it settle for 10 minutes, and then carefully spoon into the jars and seal while still hot.